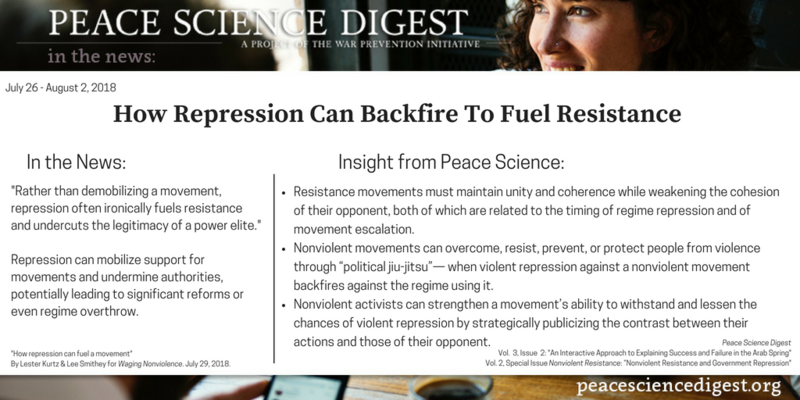 During resistance movements, repression can backfire. Rather than crippling the resistance, repression often fuels resistance and undercuts the legitimacy of a power elite. More resistance movements are choosing to adopt nonviolent forms of struggle as the effectiveness of nonviolent resistance becomes more widely known. Since 2010, the success rate of nonviolent movements—though still higher than that of violent movements—has decreased dramatically, partly due to target regimes’ use of increasingly savvy responses. Contrary to popular belief, nonviolent resistance movements are subjected to mass killings much less frequently than violent resistance movements are. There are multiple ways nonviolent movements/methods can overcome, resist, prevent, or protect people from violence, including “political jiu-jitsu”— when violent repression against a nonviolent movement backfires against the regime using it. Nonviolent activists can strengthen a movement’s ability to withstand and lessen the chances of violent repression by strategically publicizing the contrast between their own actions and those of their opponent, strengthening organizational/civil society capacity, and taking measures to facilitate security force defection. The success or failure of a civil resistance movement is best understood within a dynamic framework that can account for the interactions between movement activists and the regime, particularly the bearing their respective tactics have on the unity and coherence of the other side. The success of a civil resistance movement depends on the movement’s ability to maintain unity and coherence while weakening the cohesion of their opponent, both of which are related to the timing of regime repression and of movement escalation. “How repression can fuel a movement” By Lester Kurtz & Lee Smithey for Waging Nonviolence. July 29, 2018.